This practically one pan prep Parmesan Pesto Chicken recipe makes the ideal dinner for those busy nights or anytime you want hassle free yummylicious eats! You can also prep most of the recipe ahead of time for a lightening quick dinner! Sheet Pan Parmesan Pesto Chicken with Potatoes, Broccoli and Carrots is a satisfying flavor bursting MEAL-IN-ONE and is SO ridiculously EASY with pantry ingredients!! This practically one pan prep meal makes the ideal dinner for those busy nights or anytime you want hassle free yummylicious eats! Line a Jelly Roll Pan (10x15) with foil and lightly spray with cooking spray. Add potatoes and 2 tablespoons Pesto Mix. Toss until evenly combined then spread in a single layer. Roast potatoes for 15-20 minutes depending on size. 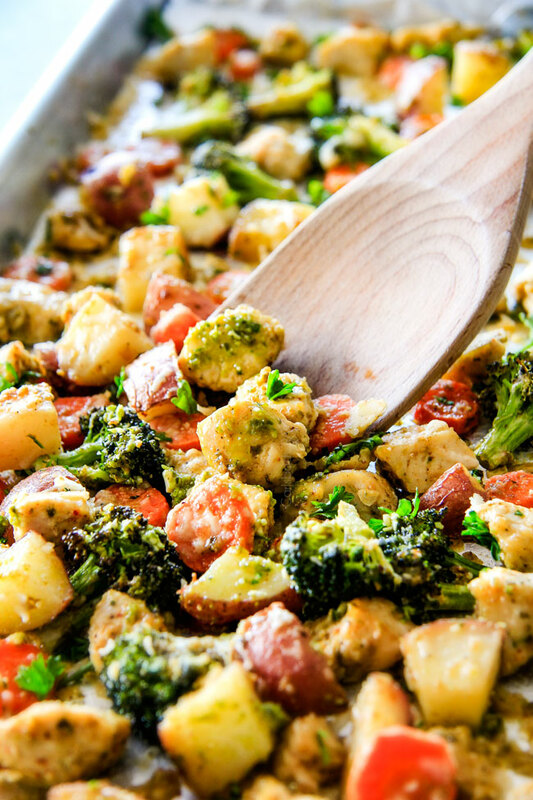 In the meantime, chop your chicken and other veggies then add chicken, broccoli and carrots to large bowl with Pesto Mix and stir until evenly coated. Remove pan from oven and push potatoes to one side of the pan (keep in a single layer). Add coated chicken, broccoli and carrots and spread in a single layer. Bake for 15 minutes. Remove pan from oven and evenly sprinkle with Parmesan cheese. Return to oven and bake 5 additional minutes OR until chicken is cooked through, and vegetables are tender. Broil if desired to brown cheese and vegetables. *I used a small bowl in the FB video but realized later if we use a large bowl instead, we save cleaning a dish! 0 Response to "SHEET PAN PARMESAN PESTO CHICKEN WITH POTATOES, BROCCOLI AND CARROTS"